Another finished sewing project for the wee one's bedroom! This was actually sewn up over the Labour Day long weekend but I just never got the chance to take any photos of it until now. 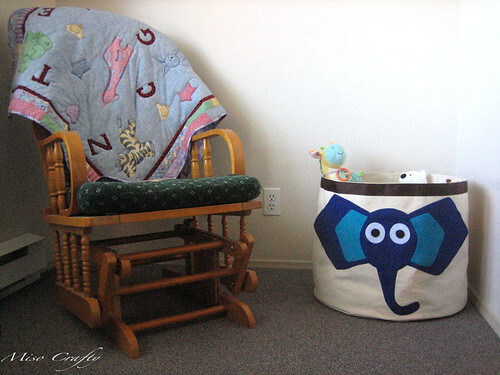 The story behind this basket: when I was in Vancouver in July I had quickly stopped by an upscale children's boutique in Gastown and had spotted an über cute basket made from thick canvas with an elephant applique made from maybe cotton twill? The one I saw had a pink elephant but the sales girl was quick to tell me that it had also come in a blue version, but that they were sold out and should be getting more later in the week. Lucky for me though, cause I wouldn't have been able to get it anyways since I was on a strict budget for that trip (after all, I needed to get onto the ferry!). A few weeks later a friend was walking past that very store and had snapped a photo with her cell and sent it to me pronto. I had been thinking about that basket ever since I saw it and knew it would be a perfect addition to the little one's room. His toys are getting out of hand and the current basket that holds his treasures is no longer sufficing. I didn't ask how much the basket was, being that it was in a pricey store, I figured it had probably cost a pretty penny. So I thought I would take my friend's photo and make one of my own. I already had the materials and I've made this style of basket before, so it was a done deal in my mind. Little did I know (had I actually looked around here locally), that a baby store here in Victoria carried that exact bin and that it was actually reasonably priced. I think they were selling it for either $40 or $50 CDN. Oh well. I had fun making this project and enjoy the fact that my little one's bedroom decorations are all Mommy-made. And who knows, maybe mine is of better quality? It is definitely made with more love, that's for sure. But I have to admit, I don't think making my own was any cheaper...maybe $10 or $15 less? Le sigh. Anyhoo, my version is made from 10.5 oz cotton canvas with the elephant made out of Eco Felt, which is made from 100% post-consumer recycled plastic bottles. I used Stitch Witchery to put the elephant together cause I really didn't want to try to sew all the pieces together. 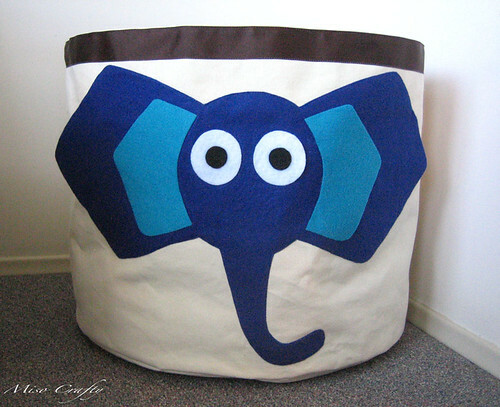 But I did sew the elephant to the bin by machine. I used 2" wide brown grosgrain ribbon for the trim on top. I made handles out of the canvas and sewn them under the ribbon. As I've mentioned several times before, I'm not a fan of unfinished seams. 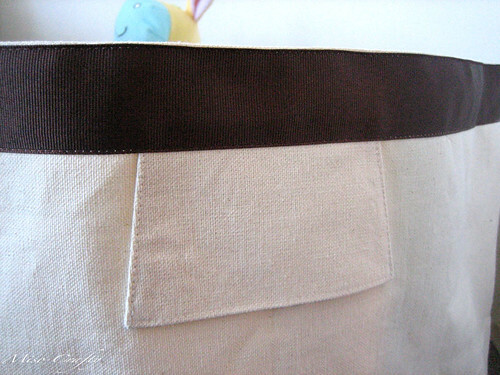 So I did a french seam along the inside of the bin and used bias tape along the bottom. I thought I would have a tough time with both of these seam finishes because of the thickness of the canvas, but was pleasantly surprised that the whole thing went without a hitch! Like the real deal, my version also folds up nicely when not in use but opens and holds up quite well when filled with the little one's stuff. This was surprisingly a quick and easy sew. It took me less than an hour to draw up the elephant's head (not an easy task when you've never had to draw one that's 15" tall!) and took an afternoon to sew up. 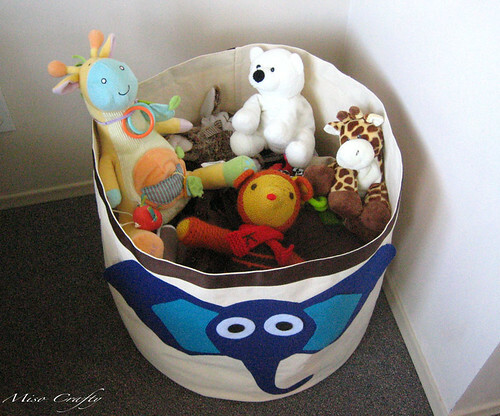 I'm thinking of making another one, but lined in vinyl, to use as a laundry hamper. But we'll see. I have a ton of things on my 'things to make list', and so I'll just have to add that idea to it too! Imaginus (http://www.imaginus.ca/) goes to UVic and Camosun a couple times a year (not sure when). They have a great selection of posters for cheep (art, movie, etc). 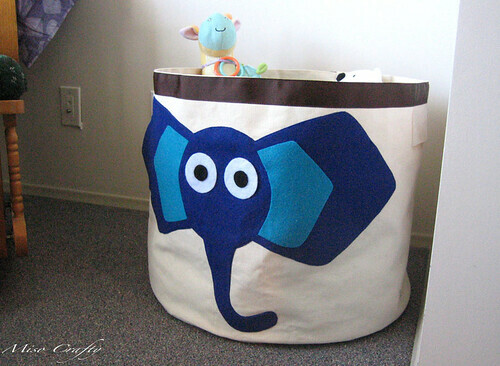 Love the elephant bin! That is A-DOR-A-BLE!!! 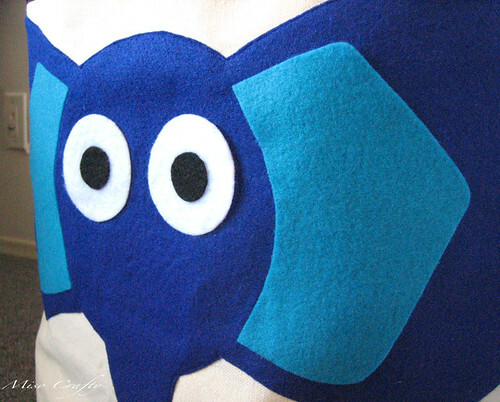 For the wall, you could make smaller versions of the elephant and put them in frames! So cute! Elephants are my favourite animal so anything with an elephant on it gets my approval. I love that when your not using it it folds up to be put away. I know a few people who would love these in their kids rooms. Thanks for the heads up! I'll definitely keep watch for when they make their rounds! Will you be at knit night Friday? I feel like I haven't been in ages, since I've missed the last 3-4! Without knowing it, everyone that has bought my munchkin gifts had always contained a giraffe, but as of late everything is coming up elephants for him! I have a feeling this basket won't be folded up anytime soon...it's the only way to keep all his stuff and his room neat and tidy!